Sewn With Grace: Time For A GIVEAWAY! The best way to motivate yourself to clean your sewing room is to show a picture of the mess on your blog! I spent a whole day getting organized and going through all my fabric and taking stock of all the UFO's, etc. I still have to work on the closet, but I'm pleased with how much I got done. In celebration of organization I've decided to give away the entire bundle of fabric in the top picture. About 95 percent of it is Denyse Schmidt fabric from her various lines including some Flea Market Fancy. The pieces range from fat quarters to long strips to little pieces. What a fantastic quilt this would make. All you have to do to enter is be a follower of my blog and leave me a comment telling me what you're currently working on. My international friends are welcome also. I will leave the giveaway open until Thursday at midnight and announce the winner on Friday, Feb. 21. Have a great day! What a wonderful space to work in. Your room is do beautiful....and peaceful. I can see fun little quilt projects in those pretty fabrics. I'm crossing my fingers and toes to win them. Thanks! I love DS fabrics - I only wish I had discovered her earlier!! Currently I'm working on a low volume quilt. Those pretty fabrics would make an awesome plus quilt. I'm currently working on a scrappy hexie quilt for our wedding anniversary this summer. It's been a long labor of love, and I adore scraps and would treasure your sweet giveaway. Thanks for offering! For the first time in a long time I am currently not working on anything. I am due any day with Baby girl! That is my excuse! I did make some new potholders for my kitchen yesterday! Your sewing room looks fabulous! I am working on several projects, a handpieced hexie quilt, a nap quilt for my daughter's friend, a bed quilt for ME! I follow via Bloglovin'. Thanks for the chance to win! For many years, wherever I would go, I'd visit the local quilt shop and "collect a yellow" and their business card! I now have a neat little singer sewing box full of cards documenting my travels (I dated the backs) and quite the stash of pale/med/deep yellows. I suspect I have 3-4 quilts worth... I just began the first and will make with yellows and browns a queen sunflower quilt using the raw edge rose bloom block that was popular a few years back. I've been inspired by your blog for quite some time and would L.oV.e to win the drawing for such fabulous fabric. Great cabinet! Thank you for the chance to win. I follow you on IG and am now a Bloglovin follower too. :). Have a blessed week! What a wonderful giveaway! I am a follower via Bloglovin'. I am currently working on three things: XO's quilt top, 2nd Birthday bear quilt for a sweet little girl named Merritt, and trying to keep the Mario quilt going (only two more blocks until the top is complete!). 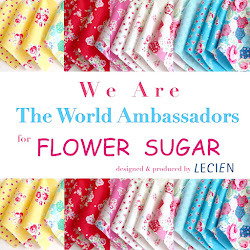 :) Thank you for the opportunity to win that wonderful fabric! the qive away fabrics ar pretty nice colors...the red and pink one's are nice for the Vingerhoedjes quilt I'm working on. Love your glass cabinets! I am currently working on a few projects....my first BOM, by Quilt Doodle Designs, a few Easter table runners and pillowcases for the grands, and an embroidery project-Snowmen A to Zzzzz-the embroidered blocks will be assembled into a quilt, I hope! No Sunday scripture! Are you ok? Wow. Here's my lucky entry. I'm sewing a denim maternity jumper today. Wow! Such a generous giveaway! Your room looks simply lovely :) I'm currently working on a few baby quilts and two blog hop projects (I follow via Bloglovin). Wow love this beautiful giveaway. I am working on Star Light Star Bright QAL with Melissa at Happy Quilting. Love your room. I'm working on an adorable coffee cup small quilt designed by Pam Kitty Morning. The top was completed maybe a year ago and I decided to machine quilt it today. 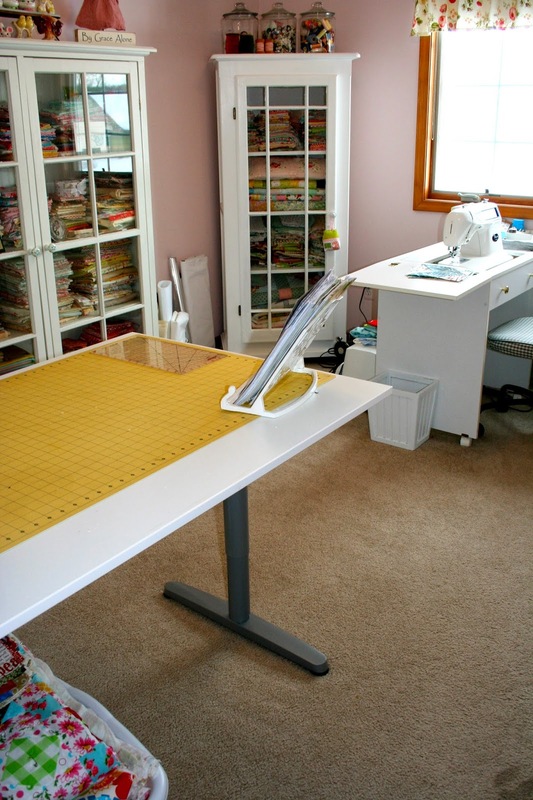 Your sewing room is awesome! I can't imagine it ever being in a mess! binding and it will be done! I am currently working on a sleeping bag for my little girl. I just finished the quilting on a baby quilt for a little girl named Olivia who is the daughter of a friend of a friend. I'm also participating in a quilt along or two and making lap quilts to give this coming Christmas. I love having a lot of projects going! I follow and enjoy your blog. Thanks for the chance at this wonderful prize! I am working on the pinwheel/churndash (if only in my mind right now...lol!) these fabrics sure would be nice! Thanks for the chance to win! I'm a follower by email. I'm doing an economy block quilt at the moment. What a nice giveaway!!!! I am a follower w/o a profile....I hope I still have a chance. I enjoy your "graceful" verses that you post. I was first attracted to your blog by it's name....Grace is my granddaughter's name!!! I am working on a wall hanging. The fabric has birds and branches all over and then I fabric transferred a bible verse of Matt 6:26 on top of it....one of my favorite verses. Thanks for the chance to help you unload!!! Hi Renee! I love your work space even before you cleaned it. The white cabinet with the glass doors is beautiful. Wish I had one like it. The fabric giveaway is awesome, I know I could make something fantastic with it. Thanks for the chance to win. I am an email follower now but I always read your blog as I to am from Michigan. It always feels great when you put your sewing room back in order and everything is in it's place! I am working on my Granny Square quilt. Just need to put all the blocks together and then send it off to be quilted. I am a follower of your blog. Thanks for the lovely giveaway, Renee. Forgot to say I am working on getting about 4 - 5 quilts quilted. I love all the bright fabric!! Im working on a bright quilt right now and would love to add some of these to it! What a great sewing room and what cheerful fabric. I have just finished a cross stitch project but I also finished working on our taxes so my cutting table is cleared of paperwork and ready to start cutting fabric. I want to begin a new top based on a Strata Star pattern designed by Ruthann Eckersley. Room looks great. Currently I am working on a jelly roll quilt and a simple rag quilt. Thanks for rhea chance to win some beautiful fabric. You've inspired me to "tidy" up my sewing room! I would love to win the giveaway and work with new colors/patterns/prints. Currently I'm working on setting up a sewing camp for some 12 yr. olds for this summer. We'll donate to the the local police department for kids in need. Thanks for the generous giveaway! I follow via email (laura84watt). What a beautiful sewing room you have. I am almost finished a queen size QAYG quilt done in homespuns. My biggest quilt yet. Thank you for the wonderful giveaway. I am a new follower! I am currently working on the binding for my moms quilt and cleaning my space! Your fabric cabinets are gorgeous with all that stash showing through the glass doors! I am trying to quilt up a few small projects to mark them off the UFO list and will finish binding and labeling my Easy Street quilt this week for our guild's quilt show next month. You said, 'International friends' and I said, 'Hot dog! That's me!' Technically I am an American living in Ireland, far away from good, big, reasonably priced, fabric stores. I am quilting a scrappytripalong right now made from years of quilting scraps. I plan to give it to friends moving back to Australia from the Netherlands. Would love to make some great, bright pillows for our kids with those fabrics! Wow! what amazing material! The mother is working on stitching some applique in French General, Miss H is back to the hexi's and Baa is struggling with his skinny pincushion! Wow! Your room looks great! Thanks for the generous giveaway! I am working on making some table runners at the moment. Wow, what a great gift! I am a follower! I follow your blog with email. I guess Canadian is international ! I am working on a Quilt called Seasons of Migration (totally Canadian) Love your sewing room. Its so cheery and bright! Love your blog. Your fabric cupboard is awesome. I am working on a quilt for my daughter, and some zipped pouches for friends. I just adore your glass cabinets - they are so gorgeous, especially filled with all that lovely fabric. I follow you on bloglovin :) currently I am working on a simple square patchwork for my daughter and a star quilt ( as my leaders and Enders). Thanks so much for the chance to win such a wonderful giveaway. beautiful room... i too am doing that same thing! getting motivated, and cleaning up... taking stock... finishing up small projects, just to get warmed up! Good job cleaning up! My problem is always keeping it clean later. Goodness, if I had a magic wand I would surely want to use it to get my sewing room as neat as yours! Such a nice, generous stash give away! I love your sewing room!! I have just moved and now have a much bigger room, yeppe!! so sad to say i am not working on quilting yet but soon ! I have to get the shelving up and then the fabric. then i am going to try and get some of my UFO's finished. I am working on my tatting though,does that count?? I'm also decluttering and organizing my fabric stash. Trying to get started on a purple/orchid colored quilt. 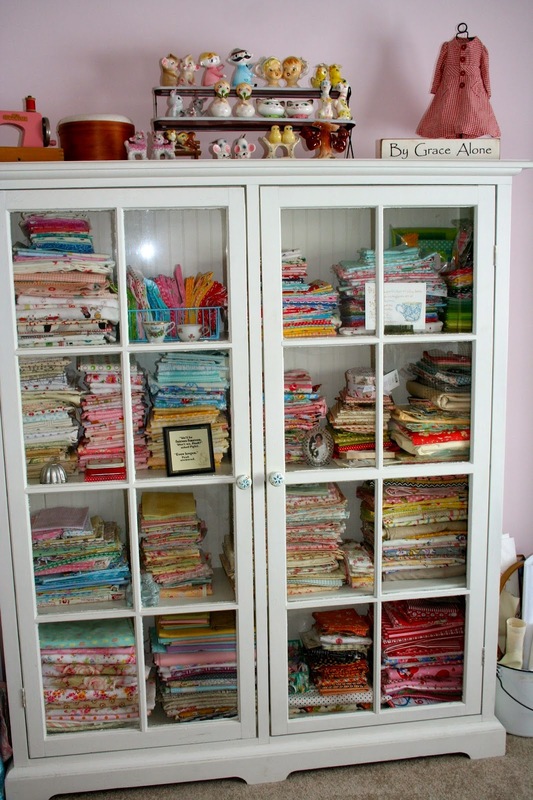 Your sewing room is so organized! I wish I had a space to call my own. Presently, I am working on a baby quilt for my new grandson. Thank you for the contest! Love your space and all the colors of fabric! I am currently working on a skills sampler and hand quilting a quilt for my mother in law. I love the little red dress above the sign "By Grace Alone." How precious! Currently, I am working on some wool pincushions and tiny fabric yo yos to be affixed to a mat and framed for a friend. What a beautiful space! I'm still working on getting my own space done and hope to be moved in by the beginning of March! thank you for a chance to win. Oh, Renee, your sewing room looks beautiful! I love your blog and am always inspired. Currently, I just finished a cloth book with felt pages for keepsakes. Since I finished it about 30 minutes ago, is that still current? LOL Thanks so much for your generosity. The giveaway looks yummy! I love the cabinet.I am currently crossstitching a butterfly quilt .I am making a cat wall quilt,too. oh, these fabrics are sew pretty. I am working on a wallhanging for a new granddaughter expected to arrive on April 2nd. Thanks for the great giveaway and I am a follower. Lovely fabrics. I am working on shabby fabrics sweetheart houses. Thanks for a great giveaway. What a beautiful sewing room you have! And what an amazingly generous giveaway! I'm working on a Jane Townswick applique quilt from her book Applique Takes Wing. 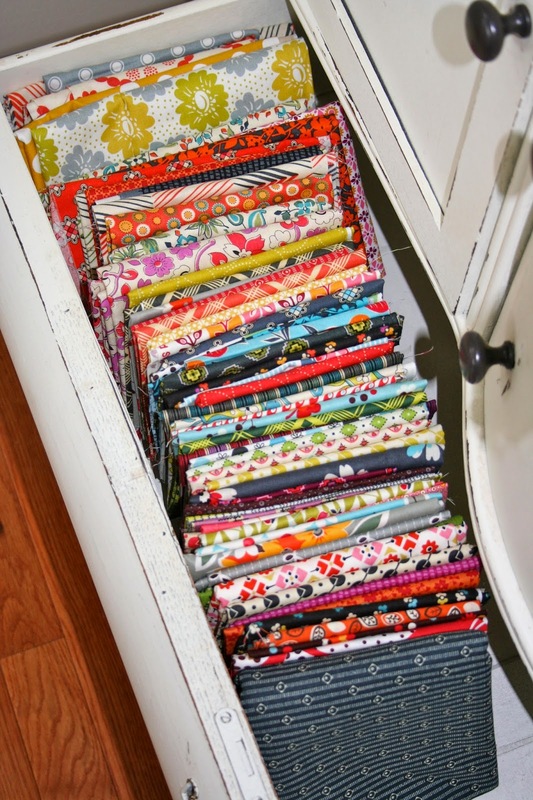 Thanks for sharing your sewing room, your fabric, and all the inspiration on your blog! I follow you via Bloglovin. Are you sure you really can part with these fabrics? They are soooooo gorgeous! I'm actually working on some yarny projects, and am waiting for the fabric to arrive for a quilt for my big boy... (I follow you). Your sewing room is so nice! I'd love a dedicated spot like that, where I wouldn't have to move stuff every time I start sewing! Current projects are--machine piecing a Stems quilt out of Denyse Schmidt fabric and finishing up my Whirligig quilt, while my hand work time is spent hand quilting my Marcelle Medallion. I am hoping to get on with some sewing for me soon - I want to make a quilt and keep working on my hexagons projects. Working on charity quilts for our guild in Northern Michigan ... there is such a need for them at the neo-natal center at the local hospital, the VA facilities and some of the nursing homes. These fabrics would certainly be welcomed to our "charity stash". Your sewing room looks great ... makes me itch to take a day or so and get mine back into order. They get so "untamed" so very quickly! You will have fights in the streets over such beautiful material. I follow you by email and showed my husband pictures of your studio. Told him that's how I wanted my room to look. I think I shocked him, his eyes are still glazed over. I love, love, love your blog and I am working on a number of projects (isn't that what we do as sewers)? your working space is just beautiful, you are very fortunate. Thank you for opening up this opportunity. Hello from Russia! My name is Nika. You can see my quilt in my blog. The quilting is so new for Russia, I will be happy to win this beautiful fabric!!!!! I am currently working on a patchwork pillow for my sister's birthday. Thanks for the opportunity to win! Hi Renee, I've been following your blog for about a year and love it! I stumbled across it and immediately was drawn in because I am also a follower of Jesus and we spend part of every summer in South Haven, MI. I have stayed a follower because we also share a similar love of color, knitting and quilting. I joined the Downton Abbey mystery quilt-a-long with Love Bug Studios so that is what I'm working on. I'm using the Lady Mary colorway and loving it! Hello Renee! I so enjoy your blog!! My first grandchild is due March 30th and I am so excited! I live in Arizona and I am flying to California on Friday to attend the baby shower. My DIL is registered at some fancy baby stores but I decided to get out my sewing machine and get to work. I have made some "Burpies" and a "Tummy Quilt" I took pictures and I must say I am very proud. I would LOVE, LOVE, LOVE to win so I can continue to make more gifts full of love for my 1st grandchild!! Thank you! Greeting from snowy Mid-Michigan via BlogLovin'. I'm working on a scrappy Anvil quilt to give to my Father & Wife as a Peace Offering. We have a strained relationship that needs some fixing, so I'm making them a quilt. I would be so proud to be able to add your pieces into it to brighten it up like spots of sunshine. As I feel like a recently "saw the light" here. Thank You for the chance to win your generous offer of a prize. Have a Blessed Day. What a sweet room! Oh, the inspiration you must get in there. I have a very small Denyse Schmidt collection that I would love to add to. Thanks for the opportunity! I love your fabric stash! I am a follower of your blog too. I just finished making a friendship braid quilt for my BFF's daughter for her 10th birthday last night. I'm not sure what my next project will be, I may go back to working on my EPP. Although, I have 3 jelly rolls that I want to make into one king sized jelly roll race quilt for my bed. Hmmm!!! I'm currently working on an owl applique project I got at the Cincinnati Quilt show last year. I am a happy follower! :-) I love your sewing room... but what is on the table? It puzzles me. I'm working on a gift for a friend. Thanks for the fun! What a generous giveaway. Love reading your blog. Everything you make is always so pretty. I also love the Bible Verse you post on Sundays-such a beautiful way to witness and tell others about our wonderful God! I currently have several projects started but my biggest one is a quilt I am making with reproductions fabrics. I'm working on a dress & 2 quilts. I'm following under my debbie@wowilikethat.com Thanks for the chance to win. Love the giveaway, thanks! I'm working on a nine patch but haven't decided on the colors yet. Part of your stash would definitely help decide me! :) I follow on bloglovin. Working on a simple quilt for a friend's retirement, it will be simple but it truly be done with love, and good intentions. I am a long time follower and right now I am quilting three quilts by hand. When I get tired of one I just move to the next and they are almost done. Thanks for a lovely give-away. I am a follower of your blog. Right now, I am working on baby bonnets for my easy shop. I need to finish them before I go to Pittsburgh this week-end where I will be making a rag quilt with my granddaughter. Oh my, what a bundle!! I follow you with bloglovin' and I'm currently working on a UFO from October. It's a black cat quilt from the tutorial at the Mermag blog. Halloween for St. Patrick's Day? Currently I'm not working on anything, as me and my 2 girls are sick. Awesome giveaway! I'm a new follower (by email) and I am currently working on a chevron baby quilt and a plus quilt. Thanks for the chance to win! Carriecmayer@yahoo.com. I'm having a hard time posting a comment for some reason...hoping third time's a charm! I just finished basting a string quilt, I have a baby quilt ready to be basted, and I have finished four Farmer'wife sampler blocks, with sixteen more cut and ready to be assembled. I follow your blog weekly. Your fabric is beautiful!!! Just stumbled across your blog and look forward to reading it now that I've subscribed. Thanks for the generous giveaway! Hi!!!! Thanks for the give away!!!! I am working on the Delightful Stars QAL!!!! Having lots of fun!!!!! I am currently working on a pillow cover that was originally started by my husbands great grandmother... I am finishing it and adding my daughters hand prints. All to give to my husbands Grandmother for her Birthday. Hi! I follow on Bloglovin'. I am working on hand quilting a little quilt for a friend, and a black with scrappy tans creation. I hope I win; that looks like a wonderful prize! I have been working on sample pillow cases and drawstring backpacks for my after school sewing club. All samples will be donated to kids at a homeless shelter I sew clothing for. What an awesome giveaway! Thanks for the chance! I am working on an over-sized tote bag...and starting on a t-shirt quilt for my sister. I'm working on a star quilt out of Midwinter Reds. I follow your blog. Thanks for the chance to win. I am a follower of your sweet blog for sure! It's so sweet of you to have a little giveaway... I would love to be entered into it. I just finished Suburbs and I am working on Coastal Lily... which seems to be taking a very long time! I follow via GFC. I am working on a quilt top for my group, World of Charity Stitching. It is made of cross stitch Tulip squares. I know your giveaway is over but I just wanted to say how much I love the cabinet you store your fabric in.